With spring break travel season in full swing, I’m sure many of you have flights and road trips planned in the near future. 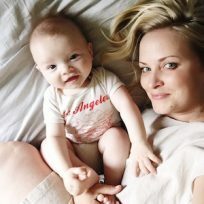 I just recently traveled (and survived) a cross country trip with two five hour flights with my family, including two boys (ages four and a half years and nine months). I prepared us in case of any minor emergency I could think of, and I think doing so helped me tremendously in the stress department. Be prepared, as they say! Here’s what to pack your own emergency travel kit for your own family, especially if you have little ones. Pain reliever/fever reducer. Teething, fevers, ear pain from flights, a headache for you—any or all of these are bound to happen when you’re traveling with littles. Be prepared with a Tylenol or ibuprofen for everyone. Just make sure to bring the proper pain reliever for your child’s age range and the corresponding dosage instructions and medicine dispenser. I buy a new bottle for the trip so it is sealed and still in its packaging. One thing I learned while on this trip is that allergy medicine for kids is good to have on hand too. Nosefrida. I seriously love this thing for stuffy and snotty noses. Pack a few extra filters too. Honest Bug Spray. I’ve always been afraid of using bug spray on my littles due to all of the horrible chemicals, but that all changed when Honest came out with a bug spray. Since we live in Los Angeles and don’t often deal with bugs that bite, this is a must for both me and my kids when we travel to more bug-filled locales. Honest Sunscreen. I also love the Honest sunscreen, and it is small enough to travel easily. Boiron Oscillococcinum. Besides taking a supplement with immunity boosters for a few weeks leading up to our trip, I also always pack this homeopathic cold and flu aid (for family members two and up), just in case. Camilia Homeopathic Teething Relief. When the baby seems to be in a lot of teething pain, I give him ibuprofen to help him sleep, but when he’s just showing regular teething symptoms, I use Camilia and it definitely helps. It travels easily and is great to have on hand. Essential oil rollers. When traveling, I make essential oil rollers for a few things. (For a full tutorial on how to make essential oil rollers, what I dilute with, and supply list, see this post and how I use them in my home see this post.) I rub these on the bottoms of feet before naps and bedtime to help with whatever ailments we might have, or to keep immunity strong during travel. And I was totally skeptical at first and don’t think oils should replace other medicine and treatments altogether, but I do think they help and can be a wonderful way to try a natural remedy first. Be sure to label them so you know which is which. Here are some of my favorite travel rollers: a.) Immunity: Dilute ten to fifteen drops of Defender, OnGuard or Thieves (depending on your preference—I’ve used and like both) with carrier oil. b.) Breathe: Dilute ten to fifteen drops of Breathe Easy with carrier oil. c.) Happy campers: Dilute ten drops of Peace & Quiet and five drops of Happy Joy (I use this for travel anxiety for myself!). Zoe Organics Everything Balm. This stuff is so great and can literally be used on everything—dry lips, crusty noses, cuticles, scrapes, etc. And it’s the perfect travel size. Natural Calm. I started using this after my post-nursing depression started because, for me, it comes with a lot of anxiety (and I’m a bit anxious by nature anyway). I used to have to take a Tylenol or Advil PM to sleep every night, and now I just drink water mixed with this and fall asleep and stay asleep, without any medicine! It also helps when I’m having travel anxiety, etc. I was so shocked to find this so helpful, but it really is. I have the larger container at home, but these travel packets come in really handy when traveling. A digital thermometer. I always travel with a digital thermometer. Just buy a new cheap one for travel so that it can be used for any family member if necessary and hasn’t already been used by the baby rectally, and get one with probe covers. The basic essentials. I always travel with bandages, anti-bacterial ointment, and 1% hydrocortisone for any boo boos, bug bites, etc. 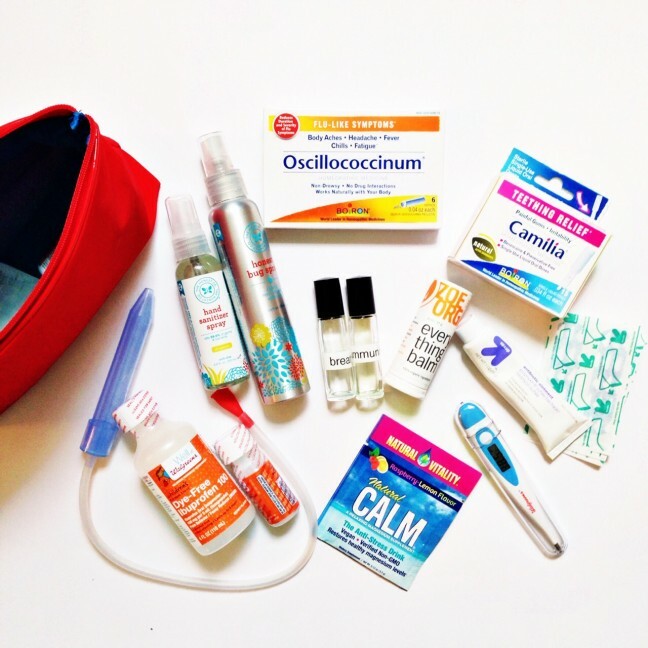 I bring this emergency kit in my carry-on for plane access (though I rarely need it) and put in any medication anyone may be taking and traveling with at the time (like thyroid medicine, birth control pills, etc.). You should always carry your medication on your flight with you in case of lost checked luggage. Oh, and I also keep copies of my kids’ birth certificates with me when we travel, just in case.